Collaborative law is one of the available options for resolving a divorce matter. It is an alternative to litigation, mediation and arbitration. This process seeks to divorce spouses with minimal economic, social and emotional negative consequences to the parties and their family. In the collaborative process, each spouse retains a collaborative attorney to advocate for his or her interests. The parties and their attorneys sign an agreement which commits them to working together to derive the best agreement for them and their children without resorting to litigation. Should either party seek to commence litigation, both parties must terminate the process and their collaborative attorneys must withdraw from representation. Both parties will then have to retain new attorneys to represent them in the litigation process. Moreover, if the process is unsuccessful, the parties’ discussions, partial agreements or positions, and any document produced in the collaborative process are excluded and inadmissible in the litigation setting. During the collaborative negotiations, parties may choose to retain collaboratively-trained, financial experts and mental health experts to assist them in creating options for resolution. Mental health experts assist the parties in effective communication and expression of ideas and may act as the voice for the children of the marriage to help to draft a custody and parenting plan. These professionals work for both parties and are retained if the need arises. If necessary, these professionals also participate in conferences with the parties and their attorneys. Rotolo Karch Law's partner Steven J. Karch is trained as a collaborative divorce attorney. How does the Collaborative Process Work? Parties participating in collaborative divorce work together in a non-adversarial way to negotiate solutions. The parties agree to communicate effectively, respectfully and constructively, while expressing their concerns, goals, needs and ideas. Most settlement discussions are held by all parties involved and with the assistance of financial and mental health professionals if necessary. The parties are encouraged to communicate effectively throughout the divorce process so that they can maintain a healthy relationship with each other and the family after the divorce. The timetable of a collaborative divorce is controlled entirely by the parties. There are no mandatory court appearances and court submissions, keeping the process private, and the parties can direct the speed at which the divorce proceeds without penalties. For this reason, this process is generally less costly than litigation, although even in litigation the costs can be minimized when the parties cooperate. 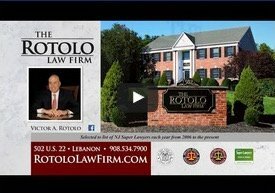 Victor Rotolo was selected to the list of "NJ's Best Lawyers for Families," which was announced in the April 2018 issue of New Jersey Family magazine. Attorneys selected to this list are chosen by NJ Family parents and readers who complete a survey nominating attorneys "who made a difference in their family's lives during trying time."